Be sure to block air leaks around your doors and windows. Even the smallest cracks and holes can contribute to the increase in your energy bill. You can put weather-stripping and caulk in these areas to seal the leaks. You can even place garment rolls like towels and old-fashioned clothing at the bottom of the doors to prevent currents from flowing in. A fireplace can help your heating systems in giving your home enough heat. But if it is not in use, it can work against you by letting a huge amount of heat to escape. To prevent this scenario, be sure to cover the chimney with a chimney plate or protector and place a blanket or a piece of board in front of the fire pit. If your feet are cold, your entire body chills. That is why before the temperature becomes unbearable, it is good to purchase affordable carpets and throw them down on the bare floors. It will not add heat in your home but will surely give you additional warm comfort, so you do not have to set the thermostat too high. You do not need to waste energy in unoccupied rooms. So if you are running your heaters, close the doors of the empty rooms so that the heat will be distributed to essential parts of your home. This will save you big time on your energy bill. If you are planning to upgrade your heating system, choose an energy-efficient unit for greater comfort and savings. There are a lot of HVAC units with advanced energy -saving features available in the market. Ask an HVAC professional for reliable recommendations. If you have an existing unit, be sure to schedule a regular maintenance service as early as the fall season for guaranteed efficiency and proper operation. 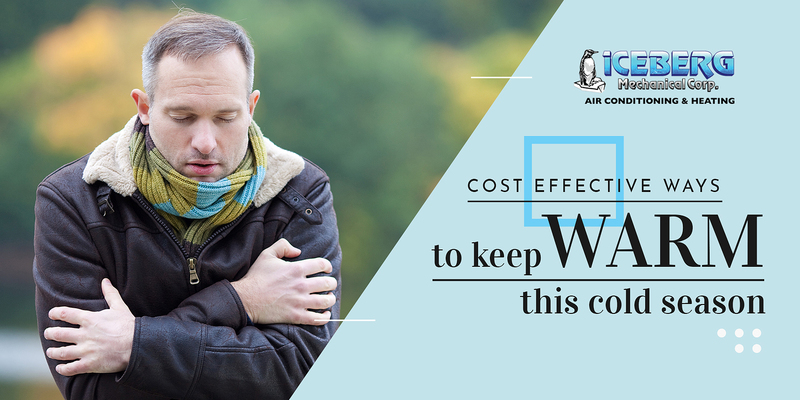 Looking for ways to save cash without compromising your comfort when the temperature drops? Our experts at Iceberg Mechanical can help. Talk to our professionals for proficient advice and helpful guidance. Give us a call today!